Capturing your wedding on film or video, or at least elements thereof, is almost as important as the celebration itself. 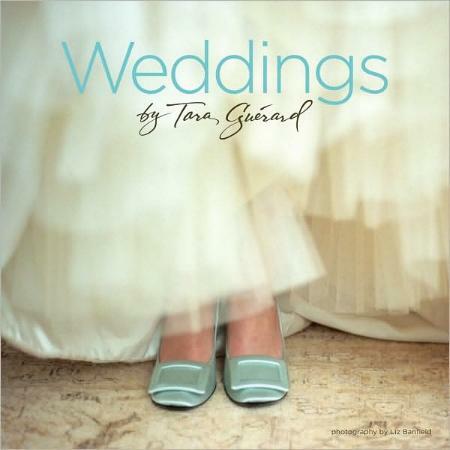 Using books like this one by Tara Guérard will help you decide on your shot list for your photographer. Take for example the Contents page: full of snippets from weddings, things the bride probably never even saw. Known for her attention to detail, Tara's weddings are glorious affairs (or not, depending on your ideas and taste) and she shares these ideas-come-to-life in her wonderfully expressive book. Eleven couples' weddings are featured and each consist of: Mrs. and Mrs. (who they are); The Scene (Design and Décor); Bright Ideas; Menu; a recipe, Soirée Signature (wedding favors or flowers, lights, or candles, etc. ); Happily Ever After, and Short Story (a brief summary). Tara has some great ideas such as the favors on pages 20/21, the table on page 78, the flowers on page 129, the gorgeous floral centerpieces on page 152, and the caged wedding cake on page 157. There are lots of personal things incorporated into the weddings to make everything that much more special and personal. I loved the visual appeal of this book. Lots of beautiful photos with a few words here and there giving the details. The photos tell the whole story. Visit Tara's website at www.soireebytaraguerard.com. She is based in Charleston, South Carolina and New York City. Conclusion - Absolutely exquisitely presented wedding celebrations and ideas.